An old Italian advertisement said that coffee is a pleasure to drink, and if it’s not good quality, what pleasure is it? Similarly, a padlock and chain is an theft device, and if it is not secure, what kind of anti-theft device is it? Unfortunately, some products which may appear similar may actually be very different. 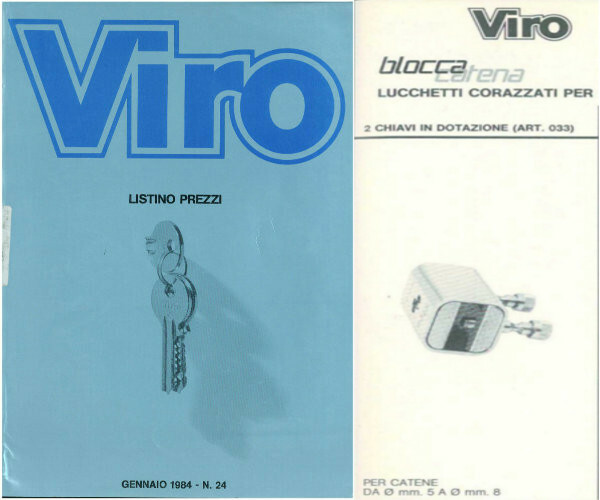 Let’s look, for example, at the Viro “Blocca Catena” padlock with 8 mm links and an apparently very similar copy and we can see what differences are apparent with a close inspection. The body of the copy is made of zamak, whilst the Viro original is made of brass. In short, brass is much more resistant to traction because it can withstand a large deformation before yielding and breaking; it is much harder, and therefore more difficult to cut and drill and also more resistant to wear. The advantages of zamak are only from the point of view of the manufacturer. Its main advantage is that it is a very cheap material and easy to work. The head of the lock-bolts of the copy are not pull-resistant, whilst that of the “Blocca Catena” are. The Viro padlock (right) has the heads of the rods with a programmed breakage point, as can be seen from the cavity inside them. In this way, if an attempt is made with burglary tools to rip off the lock-bolt by pulling the head, the head comes off, leaving the lock-bolt in place and the padlock closed. On the other hand, the imitation padlock, shown on the left in the photo, has the lock-bolts with the head joined to the rod in one piece, which can be easily gripped and used to pull off the lock-bolt. The chain links of the copy have a square cross section, whilst the links of the Viro chain have a semi-squared cross section, which are more difficult to cut. 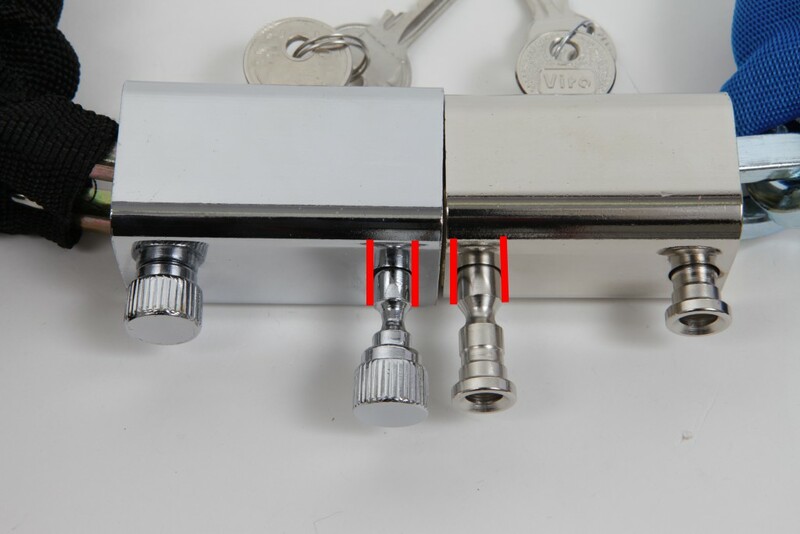 The Viro chain (on the right) is fitted with semi-square links, which are more difficult to cut with shears than the more common square-shaped links fitted on the copy (on the left). In effect, the semi-squared profile is more complicated to grip with shears, which generally have blades suitable for cutting round profiles or, sometimes, square profiles, but blades do not exist which are suitable simultaneously for both types of profiles. On the left is the square cross section, characterised by all right angles; on the right is the semi-squared cross section, characterised by a square part and a round part. The chain links of the copy are long, whilst the Viro chain has short links. 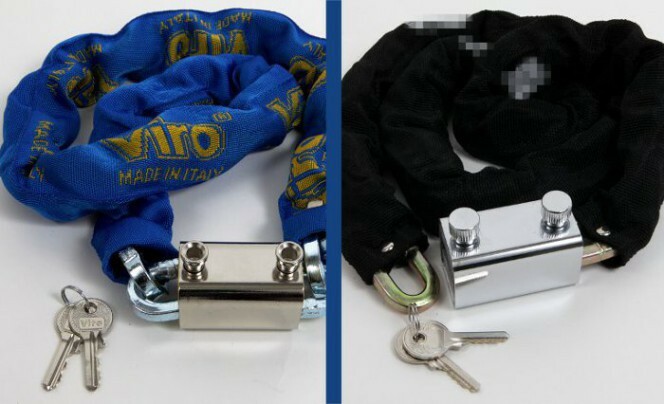 On the left in the photo is the chain link of the copy, on the right is the Viro chain link. The difference in length is clear to see. Obviously, with the same overall length, a chain made up of a greater number of short links has a higher manufacturing cost, because it needs more material to produce it, but just as obviously a short link represents a considerable advantage in terms of security, since the longer the links are which make up the chain the easier it is to insert a lever or the blade of a cutter to break or cut them. The diameter of the lock-bolt of the copy is less than that of the original Viro “Blocca Catena”. As can be easily seen, despite the external dimensions of the head of the lock-bolts which are on view, the actual diameter of the rod, which is the most highly stressed component in the case of an attack, is much less in the copy (on the left in the photo) compared with that of the original Viro (on the right). Some tests, which we will present in future blogs, have shown a further substantial difference between the two products, that is, the steel used in the armour of the Viro product is hardened, whilst the steel used in the copy is not, so has a significantly lower hardness. The copy was made with rough machining, whilst the Viro product is made with precision machining. As in the previous comparisons, the keys reveal valuable clues to the precision of the machining in this case, too. The keys of the copy (to the left) even show residual machining burrs (highlighted by blue circles) which have not been removed. The copy is Made in China. The Viro original is Made in Italy. The Viro padlock and chain is made Italy, whilst the copy is made in the Far East. A Viro “Blocca Catena” Made in Italy offers a much better performance, a greater reliability over time and, above all, the certainty of a consistent quality, whereas the characteristics of the cheaper imported products are always very variable depending on the production batch. There is a complete data sheet for all the Viro products which can be consulted directly online, so that you know beforehand exactly what you are going to buy. For all the above reasons, and as confirmed by the results of laboratory tests (as we shall see in the next blog), although a copy is cheaper than an original Viro product, there is the real risk of buying a product which is not up to the task which it is expected to perform. the certainty of a constant quality, where the various imitations can also be very different from each other. So it is better to leave the copies alone. After all, if a lock is not secure, then what kind of lock is it? 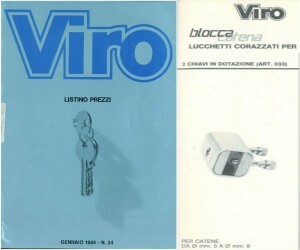 Look at the data sheet of the Viro “Blocca Catena” with 8 mm chain.